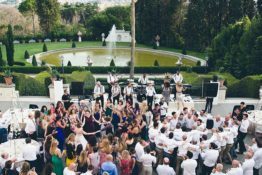 Can you imagine something more romantic than a jewish wedding ceremony in a garden with the most beautiful landscape of Rome as a background, just few meters away from you? This is what Rebecca and Jonathan wanted for their wedding in one of the most beautiful and romantic cities of the world. 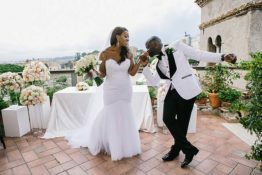 Laura and Benjo are a super nice couple from Paris that decided to tie the knot in Rome, inviting all their 280 guests coming from all over the world. 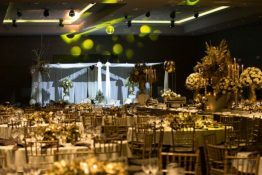 It has been a week of celebrations that started with the most important day, the day of the wedding itself, followed by the shabat party that lasted for two days. 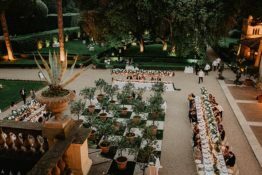 The venue for both ceremony and reception was Villa Miani, a prestigious neoclassical villa built in 1837 by the Monte Mario society, surrounded by acres of extremely cured English style lawn, that offers an absolutely unique and spectacular view fo Rome. This elegant garden facing the city was the place they chose for the wedding ceremony. 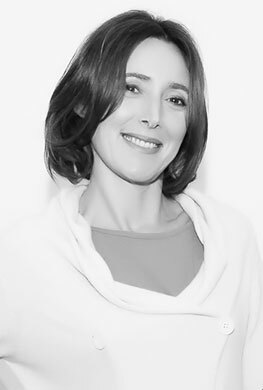 Rebecca chose to have a total white decoration with a modern and elegant style with white peonies, Dendrobium, calla lilies, Lisianthus and Hydrangeas to create a light touch. Let’s start from the chuppa which built in wood and white fabric with pillars inlaids with white flowers, everything on a white platform. The ceremony was accompanied by a live band singing and the bride walked along a white carpet decorated with pillars with white flowers in glass vases and candles. After the ceremony, some pictures with family and friends in the garden with the beautiful landscape of the city and then appetisers moment started. Buffet were richly decorated with Myrtle and boxwood and the decorations created an elegant Italian garden with different sizes of Medicean vases filled with green and white flowers. Such a great idea of the florist Andrea Patrizi that has been able to match creativity, elegance and Italian history. After the appetisers moment they moved to the patio, e beautiful open air space facing the romantic pond where the huge live band started playing. The band was an 18 elements bend that started playing both traditional jewish music and pop music. The band first introduced the wedding couple and that everybody started dancing all together like in all jewish weddings which are extremely funny and full of joy. Everybody dance from young to old people all together. The set up of the patio was really amazing, centrepieces were high iron stands with globes covered with flowers hanging. A real new concept that mixed modernity and romance, all illuminated by spots and led lights in the color of blue. Silver chairs gave a metallic and elegant touch to the wedding set up and glittering details on the napkin gave the plate a shiny effect, a real glamorous wedding. The wedding cake was a typical Italian millefoglie that was cut in the middle of the huge dance floor where everybody danced till early in the morning. We wish to thank Alessandro Zingone for the beautiful pictures of the jewish wedding ceremony.